Austin has no shortness of unique dining experiences to choose from. We have nearly anything you could want or ask for, and if we don’t have it, it’s coming soon. 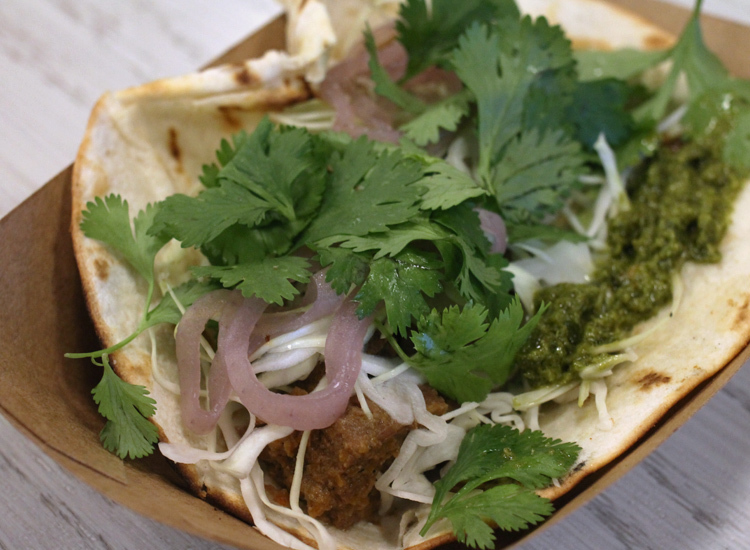 Fusion is a format and experience that’s been in Austin for some time — restaurateurs and chefs have come to realize that their food doesn’t have to just be one thing. 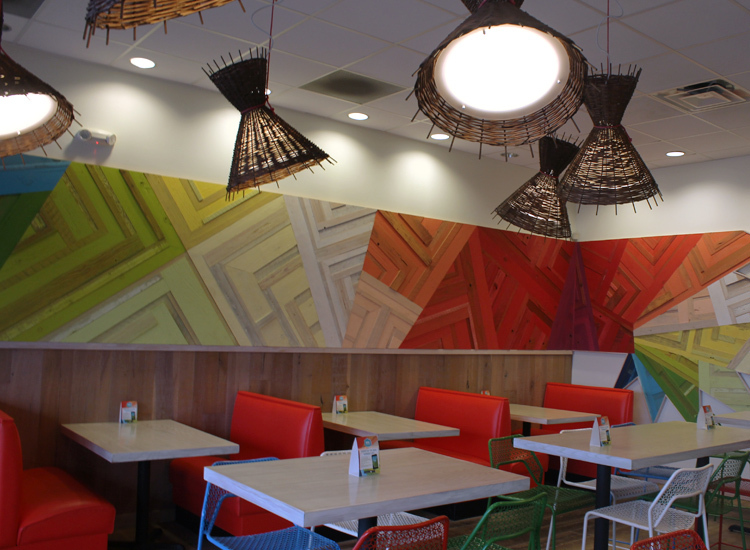 North Austin’s Dang Kitchen is rooted in authentic Vietnamese cuisine which is mashed up with a few parts street taco, a part or two Japanese cuisine, and even a dash of American fare. This version of fusion hits several pleasure points. 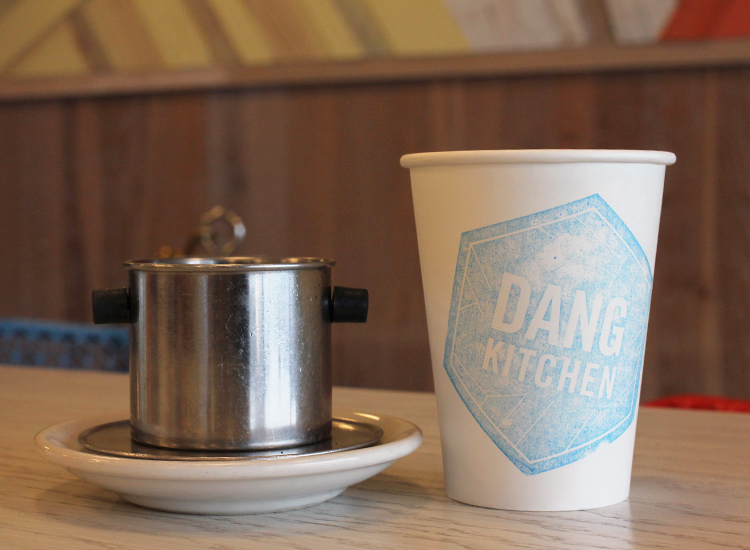 If you’re not familiar with Vietnamese cuisine, Dang is a really good jump off point. I’m going to confront my bias head-on; Vietnamese cuisine is some of my favorite food. Pho, banh mi, and vermicelli bowls carry heavy weight in my dining repertoire. While perusing the menu, I wanted to get a wide enough variety to get the full spectrum of what Dang was trying to translate to their audience while still satiating my Vietnamese craving and sensibilities. While trying to make life or death sandwich decisions, I sipped on a hot Vietnamese coffee, brewed in a kind of a pour-over mechanism that’s specific to the region. It’s mixed with sweetened condensed milk, and you’d be sore if you didn’t grab one of these, even if you’re there in the afternoon or evening. It comes with a bit of a kick, so consider yourself warned. Vietnamese Coffee. Photo by Phat Foodies. 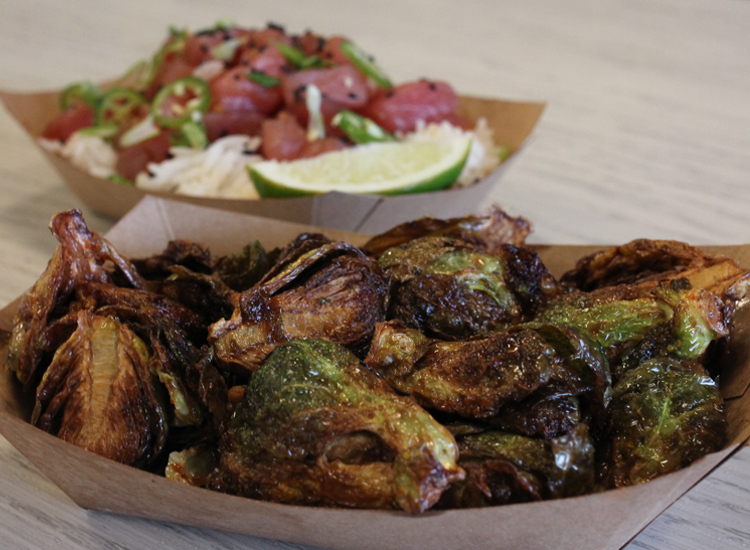 The first dishes that caught my eye were the brussels sprouts and the tuna poke. Both solid appetizers, these two weren’t reinventing the wheel but were very solid and not too expensive. The sprouts were flash fried in a really tasty Sriracha/soy based sauce and clock in at around $3. 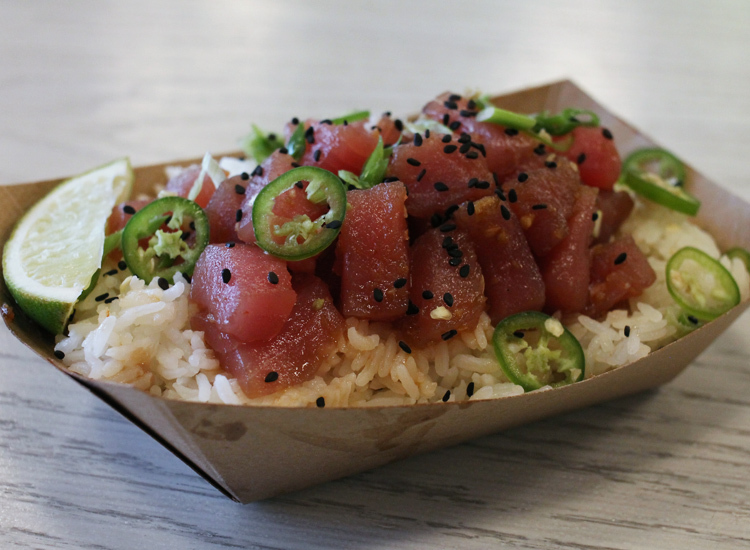 The tuna poke, dressed with fresh jalapeño, sesame seeds, and white rice rings up at $6. Brussels sprouts. Photo by Phat Foodies. Tuna Poke. Photo by Phat Foodies. TheMiso Guisada and Prawnto tacos also came out with the appetizers. I was a little apprehensive, but both tacos were pretty tasty. The Miso Guisada was also quite simple, but also really good-reminded me of a refined version of a taco you’d get at a place like Torchy’s, with pickled onion, cilantro, cabbage, and avocado. Throw some hoison sauce on it and you have yourself a fusion masterpiece. 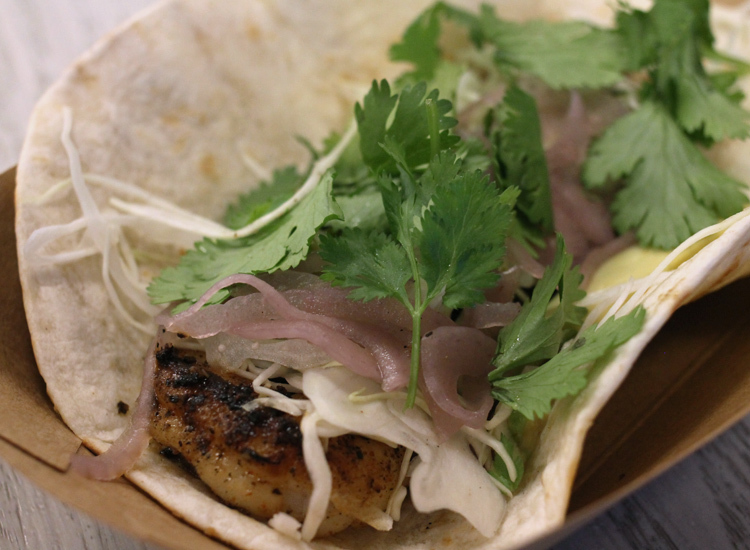 The Prawnto was a shrimp taco packed with flavor; we went with the grilled over the fried shrimp. The toppings were nearly identical to the Miso. Both came with a really tasty chimichurri sauce that really brought up the flavor of the tacos. Hit ‘next’ to see the rest! Miso Guisada. Photo by Phat Foodies. Prawnto. Photo by Phat Foodies. 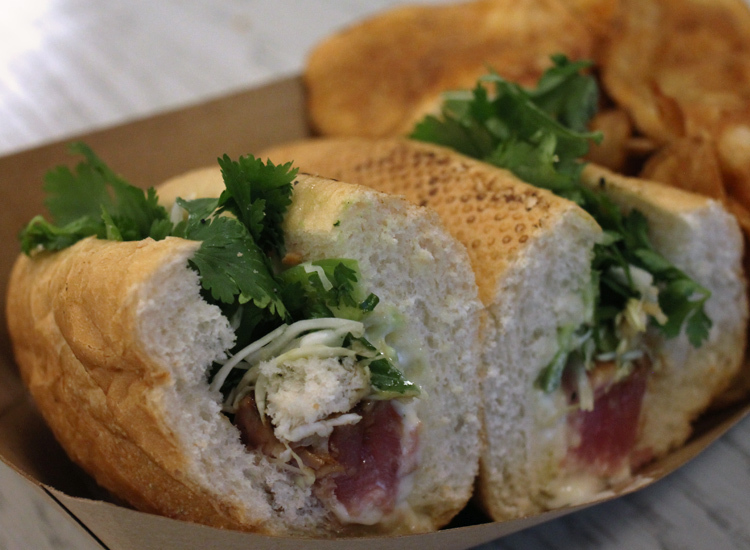 Keeping tight with my unbridled love for all things authentic Vietnamese, It was time to try the sandwiches. 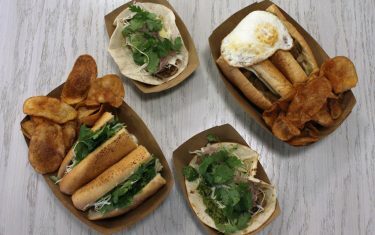 Modeled after traditional banh mi, but with a side of fusion, these sandwiches were exciting and delicious. 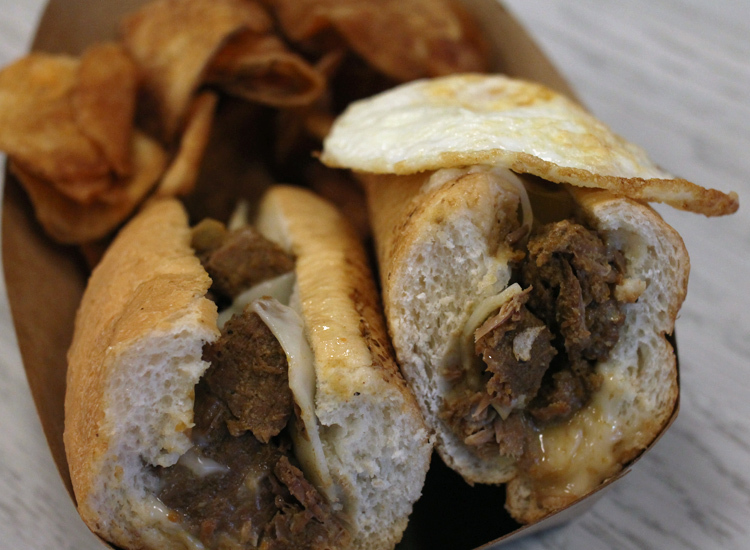 I decided to go for two out of the ordinary banh mis during my visit: The Horn, a straightforward roll with pot roast braised in miso sauce, swiss cheese, horseradish mayo, and a side of chimichurri for a little extra kick, sounds pretty dynamic right off the bat. It was even more so after I took my first bite — it was one of those sandwiches that translates simple ingredients into something big and bountiful. The Horn. Photo by Phat Foodies. Next up was the Diver — tuna, avocado, jalapeño, cilantro, mint, cabbage, and cucumber — all brought together beautifully with teriyaki and wasabi mayo. If this sounds like a flavor explosion, it was — and then some. Even though the spice picks up with each bite, you can’t go wrong going all in. The Diver. Photo by Phat Foodies. When ordering, it seemed as if I glossed over part of the menu, leaving my tasting menu devoid of some of my favorites. After noticing this glaring omission, I had to try a rice bowl and a noodle bowl. I opted for the standard rice bowl with Lemongrass Tofu. Giant pieces of fried tofu intermingled with sautéed mushrooms, broccoli, onion, along with other veggies and (surprisingly) kale chips. 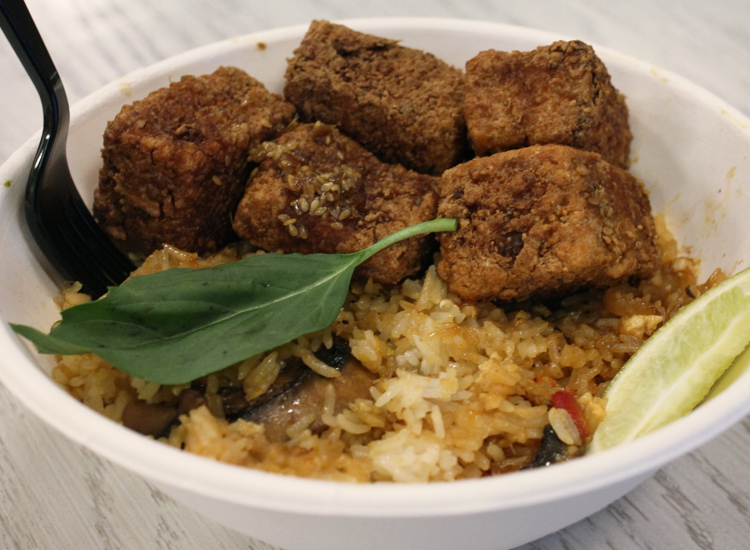 Take it from me, fellow carnivores, don’t let the tofu scare you — you need this in your life. Big flavors make up for this being meatless, and if you can’t stand tofu you can always add chicken, the miso guisada, shrimp, or tuna. Thai Basil Fried Rice with Lemongrass Tofu. Photo by Phat Foodies. I also sampled the noodle salad with grilled chicken. 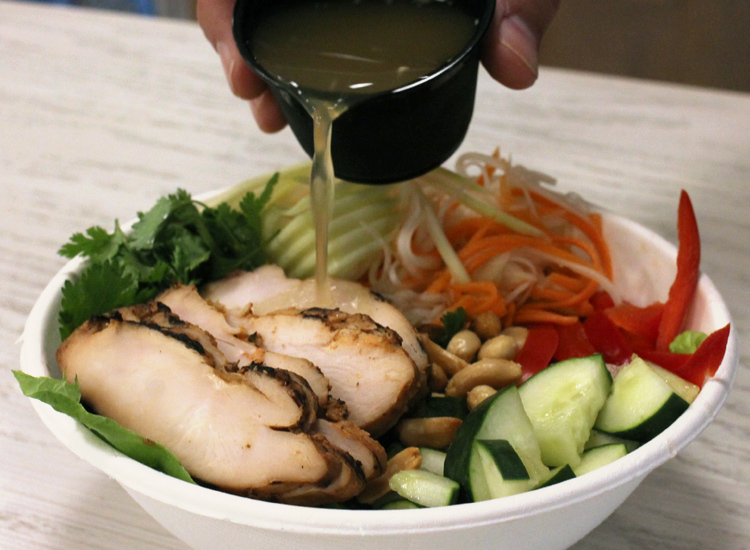 It was on par with a vermicelli bowl, or Vietnamese noodle bowl. The ingredients were really solid. You could tell a lot of love went into the preparation, -something you don’t always find going out for this kind of food. Noodle Salad with Chicken. Photo by Phatfoodies. Fusion can be hit or miss anywhere. 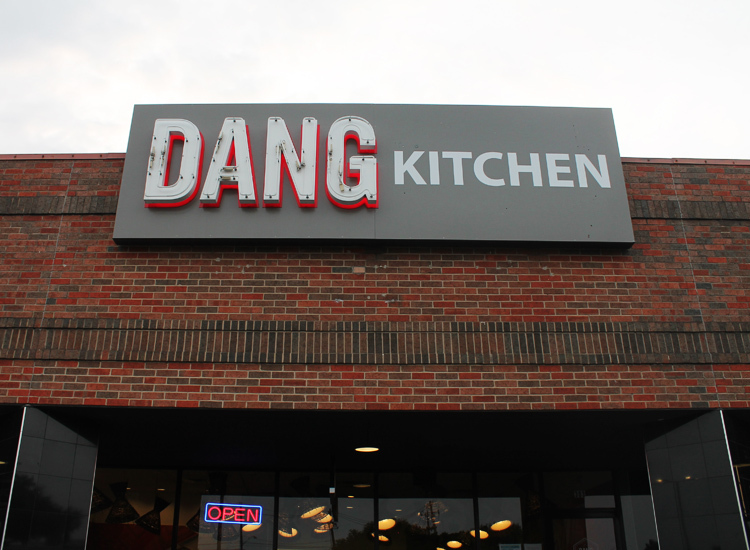 In Austin, it might be the norm, but Dang Kitchen makes sure it’s also really tasty. Featured photo by Phat Foodies.